Do you know you are His temple? God moved in when you accepted His offer of love, grace, freedom & belonging to His forever family. He moved in to you & me. Which if you have never paused to think about it before, is absolutely astounding in what that action reveals. As God is Holy, if He lives in you & I, guess what that makes us? God lives in the Holiest of Holies, His throne room in Heaven, and also in each believer who makes up His living temple here on earth. What an awesome humbling & fearful reality all rolled into one! He truly not only somehow mindblowingly cleanses us completely when we follow Him, but His very Presence, His Spirit stays with us. We tend to think of Heaven being where we will fully experience His Presence, and somehow miss the stunning reality that His Presence has been with us all along! We don’t need to wait until forever to feel Him. And He didn’t choose to wait until we arrive in Heaven to be fully present with us. He was 100% in front day one. For God to live in His temple, it must be the way He wanted it. He made us Holy so He can move in. Not only did He supernaturally make us His temple, He arranged for the decor to be just what He needed: Holy. You, and I, are His temple, and made Holy because of His forever Presence within us. If like me, all you can see are the old pics you have pinned up within, or the boxes stuffed into your attic, please believe that He doesn’t see us that way. He sees us as the most stunning treasure of them all, His Bride, whom He is ardently enamoured with, 24/7, and whom He always wants to be with, every moment of every day. Take a moment today, and thank Him for this precious gift of His Presence. He did all the work for us, preparing the perfect offering in Jesus to make us Holy. Our part is to accept this gift, open & enjoy it. 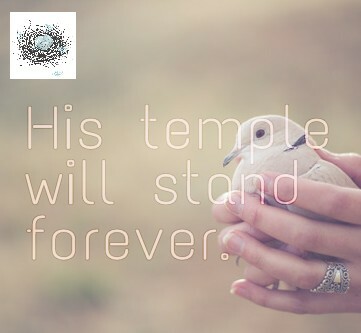 His temple, where the Holy One dwells, forevermore! Great reminder on this holiday weekend about God’s Kingdom!